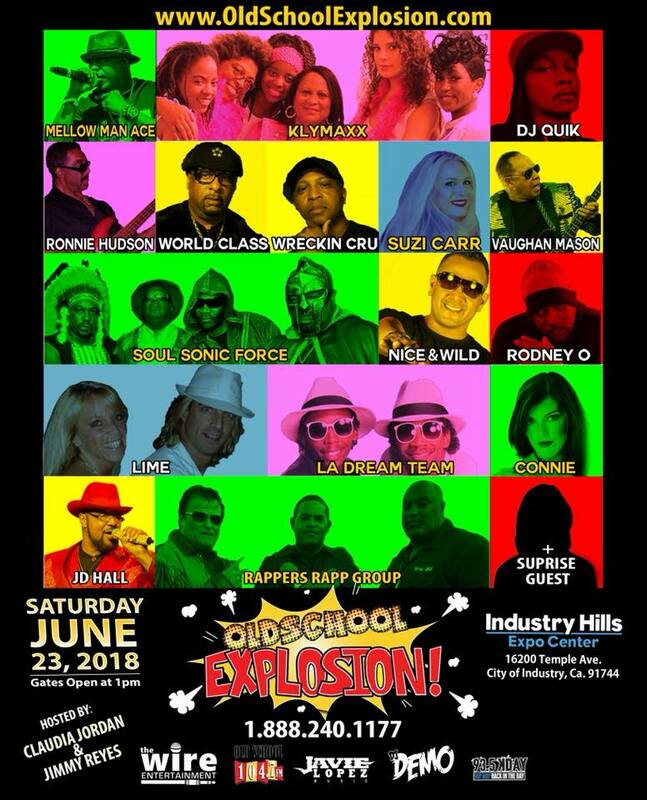 Old School Explosion Industry Hills Expo Center California. Saturday, June 23, 2018. Gates open at 1:00 pm. Hosted by Claudia Jordan and Jimmy Reyes. Featuring: Connie, Mellow Man Ace, Klymaxx, DJ Quik, Ronnie Hudson, World Class Wreckin Cru, Suzie Carr, Vaughan Mason, Soul Sonic Force, Nice & Wild, Rodney O, Lime, LA Dream Team, JD Hall, Rappers Group and Surprise Guest. Industry Hills Expo Center: 16200 Temple Avenue, City of Industry, CA 91744.